One of the things I love the most about being a vegan is calling my mom and saying “guess what I ate” and her not believing me. Sauerkraut is definitely one of those things! I’ve been craving pirogies for years. Years, I tell you. The only problem is that I never knew I wanted them until I became a vegan and then couldn’t order them in restaurants. My friends who had traveled to Poland plied story after story on me about the glories of the potato filled dumpling. It was cruel and usual punishment. A few weeks ago, I said enough is enough. I’d bought sauerkraut for the Russian Soup and had some left over, so I decided to use it half and half with the potatoes as filler. But then I ran across a recipe for a caramelized onion, sauerkraut, and mushroom base for the pierogies and fell in love with that idea. I then made the pierogi dough, boiled the potatoes, cooked some onions, threw in some shredded mozzarella teese, filled the wrappers, and voila, delicious out-of-this world lightly fried doughy potatoey creamy goodness. Everyone was right, they are heaven in a dumpling. As for the sauerkraut, I had no idea I would love the stuff. I’d never tried it until the soup–loved it–and then the bread–delish!–and now the onion mushroom base–fabulous! The tang associated with sauerkraut mellows and the caramelized onions layer well with it. 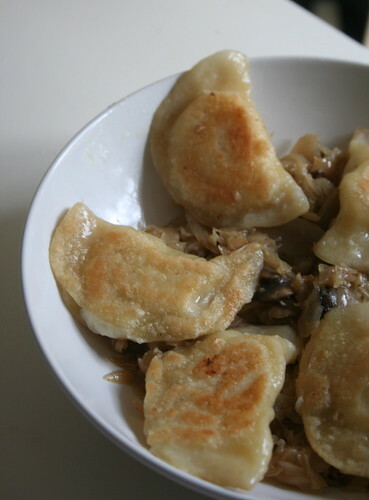 I like the base because it makes a complete meal and doesn’t rely only on the pierogies and caramelized onions. The meal was labor intensive, but oh-so-worth it, especially after I froze the leftover pierogies and boiled and fried them on demand when I wanted them. I’m sure grandmothers are rolling over in their graves for my veganizaton of it all…but that’s good for them, excercise, right?! I used this RecipeZaar recipe and this CookThink recipe, as well as my own genius (smile), to come up with the final dish. Mix all ingredients together in a medium sized mixing bowl, and knead until smooth (it will still be kind of sticky). Let the dough rest in the bowl (covered with a towel) for 30 minutes. Separate the dough into 2 parts. Roll each half of the dough until about 1/8″ thick. Cut circles with a cookie cutter (i used a wine glass). Set aside. Boil the potatoes in salted water like you’re making mashed potatoes. Meanwhile, sauté the onion in the oil until translucent. In a bowl, mash the potatoes with a fork and mix in the onions and teese. Set aside. In heavy, large Dutch oven (I used a stock pot) over medium-high heat, melt 2 tablespoons Earth Balance. Add the onions and sprinkle with salt and pepper. Sauté until golden brown, stirring occasionally, about 30 minutes. Add the mushrooms and sauté until tender, about 10 minutes. Mix in the sauerkraut and the flour, cook for 2 minutes. Stir in the water. Cover the Dutch oven and reduce the heat to medium. Simmer until the sauerkraut is tender and the mixture is thick, about 20 minutes. Stir occasionally and add more water by tablespoonfuls if mixture seems dry. Mix in 2 tablespoons butter. Season generously with pepper. Add a teaspoon or so of filling to each circle. Fold the circles in half over the filling, and pinch closed. You can also press the edges with a fork to make sure they are sealed really well. At this point you can freeze the pierogi for later, or you can cook them. To cook them, place the pierogies in large pot of salted boiling water until heated through, 6 minutes. Drain. In a large sauté pan over medium heat, swirl a tablespoon of oil. Add the pierogies to the pan and lightly fry each side for 4 or 5 minutes. Serve over bowls of the sauerkraut, mushroom mixture! Pierogies definitely bring back nostalgia for me!! I hope you like the chicken video..it cracks me up everytime I watch it..he he! i haven’t had a pierogie since going vegan, and even when i wasn’t vegan, the only ones i had were the frozen ones you get at the supermarket. those look delicous! I L-O-V-E pirogies! I’m just so lazy. I should make them & freeze ‘em up like my family does. They are so easy to veganize, I have no excuse! I’ve always loved sauerkraut but I never had pirogies. Although you can get them everywhere in my town. I need to try your recipe soon. you know, i didn’t start liking sauerkraut until veganism either. in fact, i thought i hated it. boy was i wrong. and pirogies! michael’s sister makes him vegan ones every christmas and they’re awesome, but yours sound much more complex and totally delicious! pierogies are my fav! my grandmother used to make them everytime we’d visit her & i just couldn’t get enough of them! mmmmmmmm! dan & i broke down & made our own a bit ago too – aren’t they the best?! you’re right – they are labor intensive, but oh-so worth it! we’ve stuffed ours with onions and potatoes, but i’m thinking we’ve got to try your stuffing combination, Jes! sauerkraut is another fav of mine! can you tell i’ve got some polish in me?! ahahhahaaa! your pierogies look perfect! fantastical work, Jes! awesome! i’m surprised that Trader Joe’s or something doesn’t have vegan perogies yet. great looking stuff though. Those are absolutely perfect! My goodness, the photo alone brings back happy memories of eating pierogies with my family!!! Yay! Oh, it’s been so long since I’ve had pierogies! Thanks for reminding me how amazing they are- Yum! I must make these! How could you ever go wrong with potatoes and sauerkraut? LOL at your “excercise” punchline! So yummy! I’ve never had pierogies, never ever. But now I want! Um, that was supposed to be exercise. Ooh I used to love pierogies, I haven’t had them in such a long time though. Your recipe looks great! Yum! Love the things … although I’d tend to eat them with sauteed onions, which just makes them oh so much richer (and heavier). These look delicious. I have been wanting to make pierogies. I love pirogies. One of my favorite memories of Pittsburgh is eating hot pirogies on Carson Street at 1 in the morning from a sidewalk vendor. What a great combination with sauerkraut. I was going to thank you for the “crab” cake props, but then I saw the photo of your pirogies and almost short circuited my keyboard by drooling on it. Growing up with a russian jewish family, these were pretty much a staple in my diet. So good.